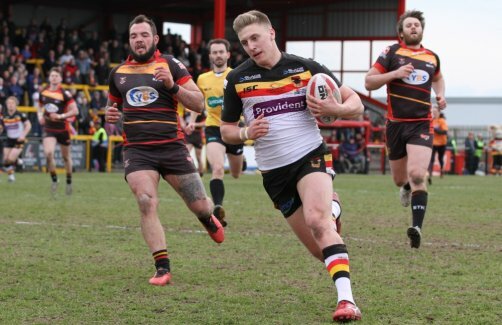 Former Bradford Bulls back-row forward Alex Mellor has signed a three-year-deal with Huddersfield Giants. The 22-year-old made 26 appearances for the Bradford Bulls in the Championship last season, scoring nine tries. Mellor was widely regarded as one of the most promising youngsters in the Championship last season and Giants Head Coach, Rick Stone, is delighted with his latest recruit but saddened by the events that have taken place at the Bulls. Like everyone I am extremely disappointed to see the ways that things have unfolded at the Bulls and frankly it’s a pretty shocking development for the game as a whole in this country and a wake-up call to everyone involved in the administration of our sport. From Alex’s perspective I guess he simply needed an opportunity and employment which I’m pleased that we are in a position to be able to offer him. As a coach you normally are quoted as being delighted and over the moon with your new recruits but for this signing it is tinged with some sadness as to how its materialised of course but as I say we have given a chance to a relatively local and young up and coming British player which is something that pleases me and will help our squad in the short and longer term. It has been a hard time at Bradford for everyone involved and I can’t thank the club enough for what they have done for me, I have been there eight years, including scholarship and I will be forever grateful to them. Like the rest of the lads I was devastated earlier in the week but to be honest I’d been well advised (by Manager, Craig Harrison) and we’d been talking about the “what if scenario…” which was a frightening thought and one that sadly came to fruition. I’m over the moon to be signing for the Giants, the set-up is second to none and there is a genuine opportunity for a place in the matchday 17, which is what my aim is.